Winter seems to have skipped Austin this year. Except for a few cool days around the start of January, the city has managed to avoid the heavy dousings snow and ice that have created havoc farther north. Spring usually arrives around Valentine’s Day, when the Texas Ash trees – always the first to bloom – just begin to show new leaves. But this year, the trees have gotten off to a three-week head start. Some trees were sprouting growth by the last week of January, and already have enough foilage so that’s it’s not possible to see through the once bare, wintry branches. The greatest surprise is on the UT campus, where mature bluebonnets are already in full bloom. The photo above was taken this past week at the head of the East Mall, next to the Main Building. Bluebonnets and other Texas wildflowers traditionally arrive in mid-to-late March, which make these a full six weeks early. 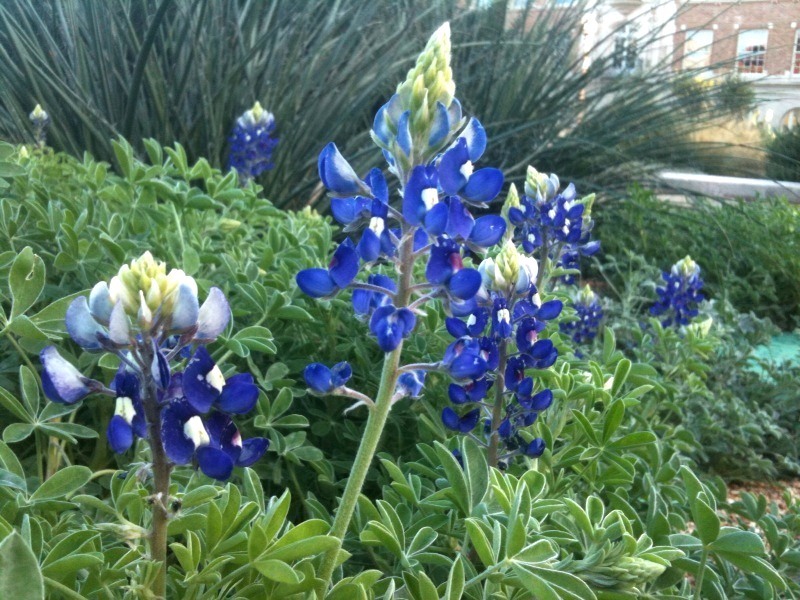 It’s good to see the Texas Bluebonnet on the campus again. For years, the Texas state flower has been scarce on the Forty Acres, but recent efforts by the staff who take care of the grounds have made a special effort to guarantee the bluebonnet’s return. 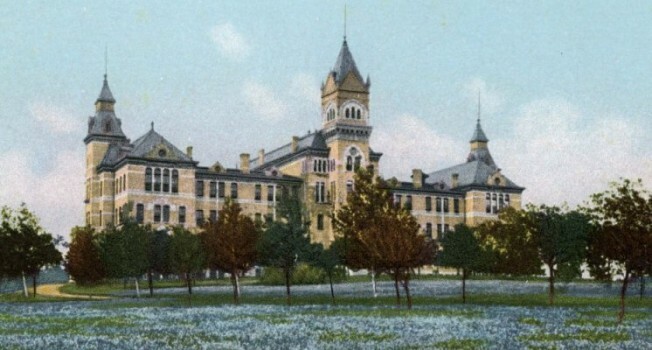 Old Main in the spring, around 1900. Such efforts weren’t always needed. For the University’s first half century, the campus in springtime was awash with bluebonnets, along with poppies, yellow daisies, and the bright red blossoms of the prickly pear cactus. The old Main Building was a golden island in a blue sea, and the wildflowers were an invitation to campus picnics. 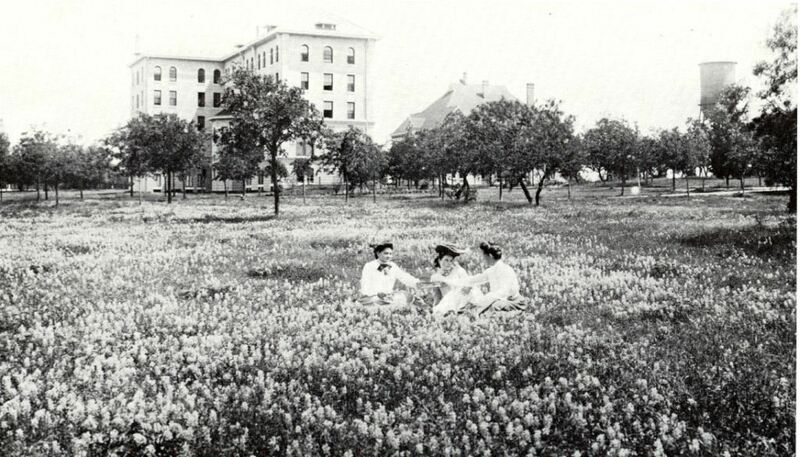 On a campus overflowing with bluebonnets, UT co-eds enjoy a picnic in 1899. The Woman’s Building, the first residence hall for co-eds (where the Flawn Academic Center is today), is in the background. In the 1910s, the abundance of wildflowers helped create an annual tradition among University co-eds. Inspired by a similar rite at then women-only Vassar College, graduating seniors passed an immense, handmade chain of real bluebonnets, representing tradition and responsibility, onto the shoulders of junior girls who were dressed in white. By 1922, the ceremony became known as “Swing-Out,” and was organized by Cap and Gown, a women’s student organization. The event was intended to recognize women leaders on campus, and to formally transfer the mantle of responsibility to the junior class. It was a prominent part of the annual Senior Week, which featured activities for all graduating seniors, both men and women. Originally, a chain several hundred feet in length was made from bluebonnets attached to Spanish moss, but as more buildings appeared on the campus, the supply of both flowers and moss didn’t last. In 1928, a reusable chain of paper bluebonnets was created, and thereafter maintained by the sophomore class. The Swing Out ceremony in the 1920s, on what is today the South Mall. Senior girls in caps and gowns have passed the bluebonnet chain, representing the ties of leadership and tradition, on to the shoulders of the junior class, dressed in white. In 1955, Cap and Gown agreed to expand the ceremony to include both women and men, and Swing-Out evolved into an event to honor current student leaders and announce the leaders for the following year, including the new student body president. But the event grew less popular in the 1960s, and the 1964 edition was the last for several decades. This entry was posted in Uncategorized and tagged Bluebonnet, Chain, Jim Nicar, Swing Out, Texas by jimnicar. Bookmark the permalink.